[Fanta] originated in Nazi Germany under trade embargo for Coca-Colaingredients in 1940. 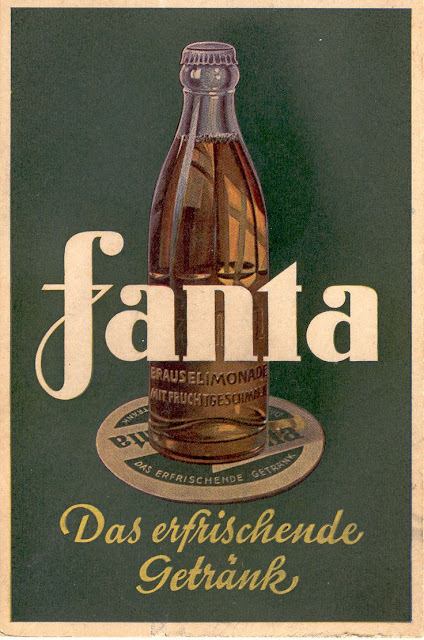 Fanta originated as a result of difficulties importing Coca-Cola syrup into Nazi Germany during World War II due to a trade embargo. To circumvent this, Max Keith, the head of Coca-Cola Deutschland (Coca-Cola GmbH) during the Second World War, decided to create a new product for the German market, using only ingredients available in Germany at the time, including whey and apple pomace – the "leftovers of leftovers", as Keith later recalled. The name was the result of a brief brainstorming session, which started with Keith's exhorting his team to "use their imagination" (Fantasie in German), to which one of his salesmen, Joe Knipp, immediately retorted "Fanta!"